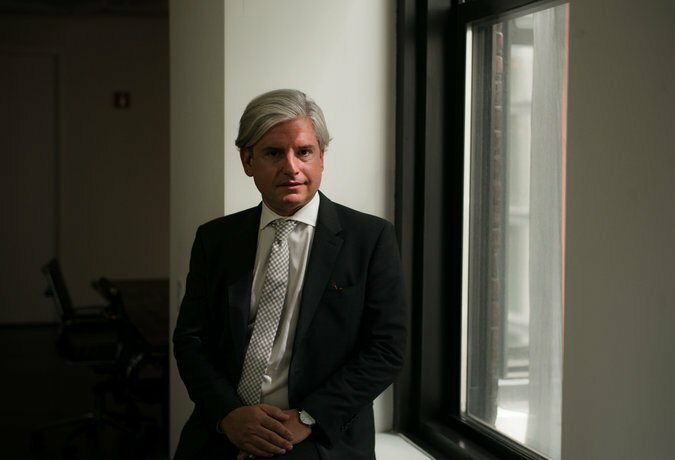 I consider one of the most dangerous men in America to be David Brock aka the founder of Media Matters. He’s a Marxist on a mission. This is a guy who has been behind taking down conservatives such as Glenn Beck, Bill O’Reilly, Rush Limbaugh and Sean Hannity… or at least trying to. He is an acolyte and a devoted backer of Hillary Clinton. 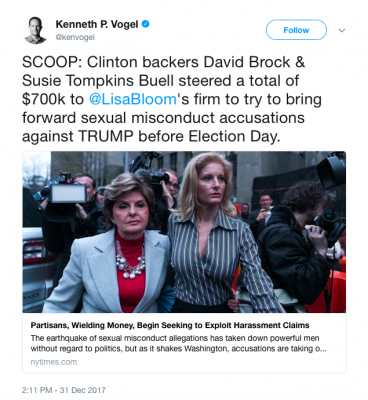 Both David Brock and Susie Tompkins Buell bankrolled $700,000 allegedly to find people who would accuse then-candidate Donald Trump of sexual misconduct before Election Day 2016. Brock’s American Bridge 21st Century Foundation and Buell, a major donor to the foundation, reportedly donated the six-figure sums to Lisa Bloom’s law firm, which specializes in sexual harassment allegations against public figures, according to a report from the New York Times. Wherever you find the left trying to nail conservatives over sexual harassment, you’ll find the likes of Lisa Bloom and her mother Gloria Allred. David Brock forked over $200,000 and Susie Tompkins Buell, one his major donors, pitched in $500,000. You remember the whole dust-up over sexual allegations just before the election took place. There are somewhere between 13 and 19 women the left trotted out. All have credibility issues and lack any solid evidence of any wrongdoing on Trump’s part. Many have been outright disproven. Bloom’s firm capitalized on the sexual harassment allegations against Trump in the lead-up to the 2016 presidential election, offering to sell alleged victims’ stories to media outlets for a 33 percent commission. God save us from bottom feeding attorneys like this. Bloom solicited money from these donors to provide so-called security and a “safe house” for women who were willing to publicly accuse Trump of sexual assault. There were four women to begin with in the game. Only two would come forward. In the end, only one came out and accused Trump and it turns out that she wanted to work for his campaign and was snubbed. They paid off her $30,000 mortgage and provided her with other perks. The other woman was in the hospital… she was offered up to $750,000 right up until the day before the election. She said no in the end after asking for $2 million. Bloom finally had to admit contacting the donors after she was exposed by journalists and had no choice. She admitted to contacting donors in an interview with The Hill in December, but she never released the identities of the donors and denied being in contact with Clinton’s campaign. We all know that is a lie. However, she did say her firm was in touch with Clinton-supporting Super PACs. Democrats familiar with Bloom’s operations told the Times that Brock and Buell were behind the donations supporting a last-ditch effort to get women to come forward with their stories to potentially sway the election results. That’s dirty politics at its lowest and David Brock is in the thick of it. Usually, these efforts fail spectacularly. But Media Matters has had success in bringing down some big names with sexual harassment allegations. In the witch hunt going on, you don’t have to have proof. Just the fact that you are accused brings you down like Bill O’Reilly and Roy Moore. The left is fervently hoping that strategy will work on President Trump. But it won’t. I still don’t buy that either of those men are guilty by the way. Notice how the cases against Moore have all but disappeared? They are still going after O’Reilly because he is still a threat. People need to insist on innocent until proven guilty here, not the other way around.